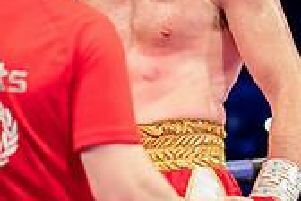 Penistone boxer Scott Westgarth died on Sunday morning after being rushed to hospital following his victory over Dec Spellman. Pic Nick Potts/PA Wire. Former British and English super lightweight champion Curtis Woodhouse admits he may never step into the boxing ring again after Scott Westgarth’s death. Woodhouse was due to fight John Wayne Hibbert in the main event after Westgarth’s bout with Dec Spelman at the Doncaster Dome on Saturday night, but his fight was cancelled after Westgarth collapsed in his dressing room after beating Spelman and later died in hospital. “It makes you second guess and question everything,” former Sheffield United footballer Woodhouse told talkSPORT. “What we are doing, the morality of it all, how can we justify what we do as a profession and as a sport? “I am not sure whether I want to even fight again and go through it all again. “An hour earlier, I was speaking to Scott in the dressing room wishing him the best for the fight and he loses his life that evening. It makes you feel numb. Kell Brook takes part in a run at Bramall Lane. “I think we have the best organisation on the planet who regulate (boxing) the best they can. “You have two trained athletes punching each other in the head. The brain is not made to be punched. They are the facts. It is a brutal way to make a living. It was only this month that Woodhouse appeared to be interested in a boxing contest with Sheffield’s Commonwealth middleweight champion Liam Cameron. But the Westgarth tragedy - and the fact Woodhouse was ringside when another Sheffield boxer, Jerome Wilson, was badly injured - now seems to have put paid to his own fight career. Meanwhile, the show goes on for Kell Brook. He fights Sergey Rachchenko at Sheffield Arena on Saturday. Yesterday Brook was joined by fans in a run at Bramall Lane. Thousands are expected at the televised light middleweight contest - but the atmosphere will be subdued by the tragedy. * Scunthorpe boxer Dec Spelman, who was beaten by Westgarth on Saturday, before the tragedy happened, is at a similar crossroads to Woodhouse. “Scott was such a good guy who has lost his life doing a sport he loved,” an emotional Spelman told the Scunthorpe Telegraph. “I am gutted, devastated and heartbroken because he is such a nice guy. “I have the utmost respect for him but when he got taken to hospital I thought this is serious and it is just heartbreaking. “This really brings it home and I will have to spend a long couple of weeks thinking about what I want to do. “But this is not about me. We need to keep praying for Scott’s family and keep strong. * Dillian Whyte has revealed Westgarth’s death has made him consider his future too. The heavyweight, however, is scheduled to fight Australian Lucas Browne at London’s 02 Arena on March 24 and will not allow himself to think further about the tragedy until at least then. Even while Whyte, 29, is hoping to earn his first world-title fight he was saddened and alarmed by Westgarth’s death following the fight in Doncaster on Saturday evening. Whyte has long fought against his family’s wishes, but despite recognising the dangers involved, dismissed suggestions the sport should be banned because of the purpose it has given him and that it can also offer to others. “I’d be lying if I said it doesn’t,” Whyte responded, when asked if he’d thought about his career since learning about what had happened to Westgarth, who was 31. “But I just try not to think about that. “It’s a bit harsh saying that but that’s the reality of the sport. “Boxing is full of stupidly and ignorantly proud fighters. Fighters don’t like to talk about stuff that makes them seem weak or make it seem like they’re scared or nervous so I’m sure a lot of boxers worry about it but they will never openly say. Whyte’s reputation has largely been built on a victory over Anthony Joshua, while both were amateurs, and on his remarkable punch resistance. Discussing suggestions boxing should be banned, he said: “It’s nonsense. More people suffer from concussion and stuff from rugby than they do in boxing. “Even MotoGP drivers suffer from being unconscious and other things.